Growing up I remember my mom always making Rice Crispy Treats with us, I always thought it was a pretty complicated snack.. Boy was I wrong! These treats are super easy to make and my girls love helping. All you need are 3 ingredients. Butter, Marshmallows and this time around I used Fruity PEBBLES™! Talk about delicious. 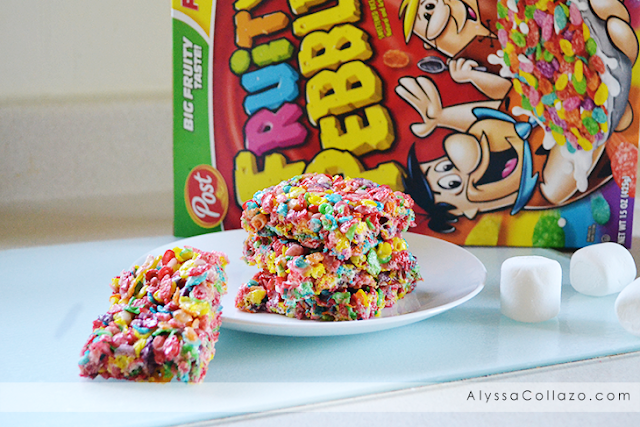 My Fruity PEBBLES™ Crispy Treats made the perfect school snack. My girls absolutely loved them and so did my Husband. Are you ready for this easy recipe? Because I am totally ready to share it with you! Melt 3 tbsp of Butter in large sauce pan over low heat. Add marshmallows and stir until melted and well-blended. 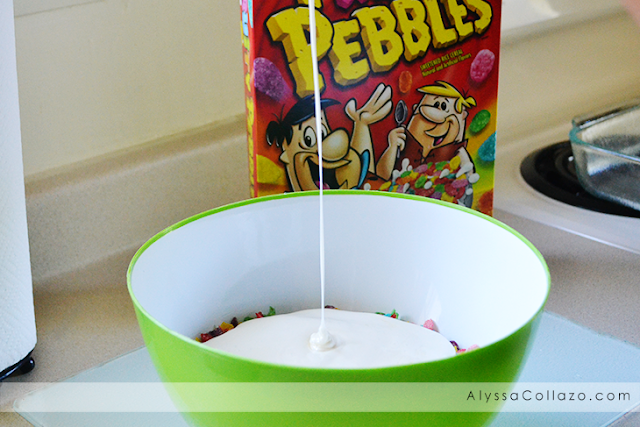 Add Marshmallow mixture to the Fruity PEBBLES™. Stir until well coated. Using buttered spatula or waxed paper, press mixture evenly and firmly in buttered 13 x 9 inch pan. It doesn't get much easier than that! I love that these treats are perfect for any occasion.. Birthday parties, school snacks, after school snacks even breakfast.. A bowl of Fruity PEBBLES™ that is! Download your Coupon and visit a store near you to try out PEBBLES™ cereal! 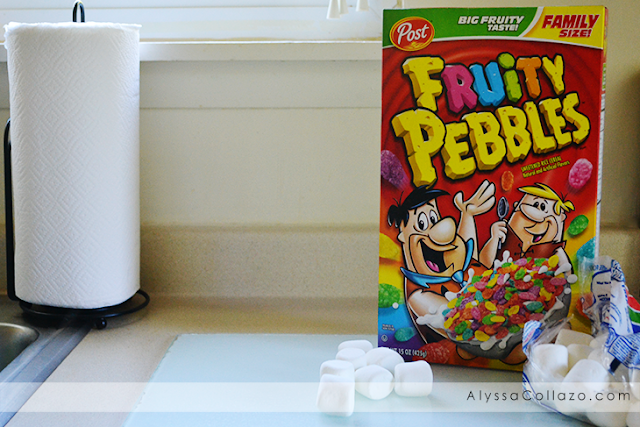 Do you have any Fruity PEBBLES™ inspired recipes? We actually make these all the time. They are my 12 year old's favorite snack! I totally forgot about this cereal! I need to try this with my kids they would LOVE this! I remember my mom buying fruity pebbles for my sisters and I growing up. I was never a fan, but I can imagine this would make a really sweet after school snack for some kids. This is a great snack that will be easy to make for on the go, or just to sit and enjoy. I haven't had fruity pebbles in years! Thanks for sharing! I love cereal treats like this. Fruity Pebbles is my favorite cereal so this looks like a recipe I would really enjoy. Fruity Pebbles always brings me warm and fuzzy feelings. What a great way to make a fun treat. Hello childhood, it has been a long time. We used to make these as kids, I've not actually had any in many years. I should make them for my kids, I wonder if they will love them just as I did growing up. My daughter's favorite cereal is Fruity Pebbles. I might have to make her these as a surprise. She would love them. Fruity Pebbles was always one of my favorite cereals as a kid. 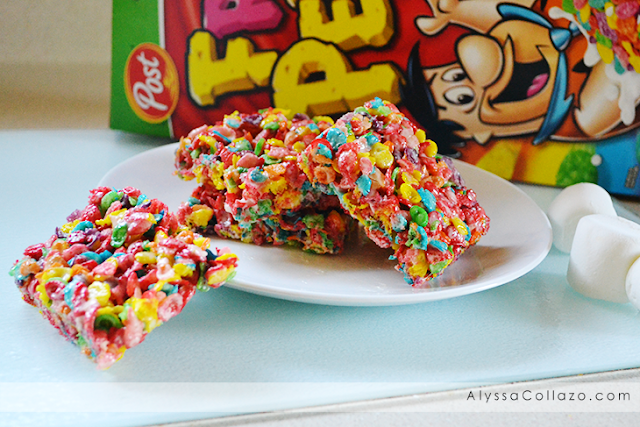 These Fruity Pebbles crispy treats I am going to have to make for the kids. Thanks for sharing the recipe. My first memory of Fruity PEBBLES as a kid was in marshmallow treats! So good! These look so good! I can see why your kids love them, and its great that theyre so easy! This is one of our favorite recipes too! I am so glad fruity pebbles are gluten free now. I LOVE Fruity Pebbles and these look soooo yummy!! Great recipe!!! These look soooo yummy! My kids would love these. Definitely need to try it out. My daughter will love a Fruity Pebbles Rice krispies!